It is extremely hard to find Sámi literature in English. This could be a deliberate strategy: Sámi author Ellen Marie Vars refused to allow translations of her work into majority languages, because she wanted people to read in Sámi. The indigenous languages of the people of northern Finland, Sweden, Norway and Russia need preserving and using, but their voices need hearing, too. Here’s just one. Rauni Magga Lukkari was “born on the Finnish side of the Tauna river” and now lives in Tromsø, Norway. I found her book Árbeeadni (Finnish: Äitejä, tyttäriä or Mothers, Daughters, English: The Time of the Lustful Mother) in a Sámi-Finnish edition from my local library. Her poems are short, but far from sweet. The book is rooted in its own landscape and language, but tells a story we all know, a journey across generations from birth to death and back again. It’s raw and cold and strong. Rauni made it into English across the North Sea – she has one poem in English in the Scottish Poetry Library collection, from a reading of her poems in Sámi, Norwegian and Gaelic, translated into English by Kenneth Steven. Here it is again; it gives you a good taste of the pain of motherhood and harshness of life that these women know from inside their own bodies. told me I am still here! You can see a few of Rauni’s and other Sámi poems in English in this article by Finnish PEN. But the best place to find out more about Sámi women’s writing is the Nordic Women’s Literature resource. This fantastic website has gathered writing from Finland to the Faroe Islands from the last millennium, and is searchable in English, Swedish and Danish. 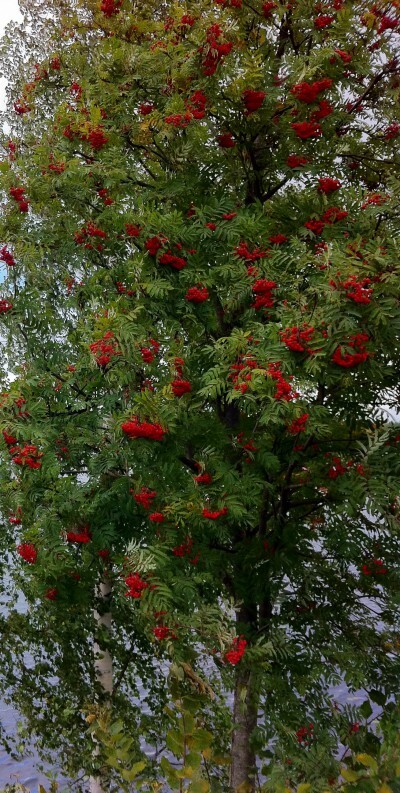 Why the picture of the (Finnish) rowan? Because the name “Rauni” could mean rowan, or the mother goddess partner of Ukko, the Finnish thunder god – or Ukko himself.